The Agra Fort, also called the Red Fort or Lal Quila of Agra, is one of the finest Mughal forts in India. It is a UNESCO World Heritage site, and located at the distance of about 2.5 km northwest of its more famous sister monument, the Taj Mahal - the symbol of love. The Agra Fort can be more precisely described as the Walled City of Agra. Built in red sandstone, the historical Agra Fort was the main residence of the Mughal emperors till 1668, when the Mughal capital was shifted from Agra to Delhi. Constructed by the Great Mughal Emperor Akbar, the Agra Fort has been one of the most important tourist attractions in the city of Agra and India as well. It attracts a large gathering of tourists coming from different parts of the world. Walking through the courtyard after the courtyard of this magnificent red-sandstone and marble fortress, you will be amazed to see and explore the brilliance of Mughal architecture. There are many beautiful palaces, residences and structures within the fortress which remind you of Mughal era. Sheesh Mahal: The Sheesh Mahal is a beautiful palace in the fort complex. This beautiful palace was the royal dressing room beautifully decorated and ornamented by tiny mirror-like glass mosaics on the wall. Diwan-i-Aam: The Diwan-i-Aam (the Hall of Public Audience) houses the beautiful Peacock Throne of the Emperor. It was used a communication courtyard between the public and the aristocracy. Diwan-i-Khas: The Diwan-i-Khas (the Hall of Private Audience) is another attraction within the fort complex. This beautiful hall of private audience was used to welcome Kings, dignitaries, and VIPs. Khas Mahal: The Khas Mahal is a beautiful white marble palace within the fortress. This elegant palace was built by Mughal Emperor Shah Jahan. The interior of the palace is richly decorated. Anguri Bagh: The Anguri Bagh (the Garden of Grapes) within the Agra Fort complex is one of the key attractions within the fortress. This beautiful garden was known for harvesting fine quality of grapes and flowers throughout the year. This is was the paradise garden designed for royal ladies as their pleasant retreat. 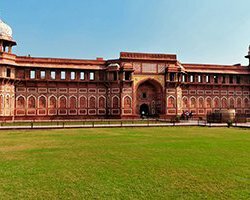 Other Attractions: There are several other attractions and structures inside the Agra Fort complex which you can see and explore on your visit here. Mina Masjid, Nagina Masjid, Jehangiri Mahal, Musamman Burj, Akbari Mahal, and Machchhi Bhawan are some other attractions you can see within the exquisite complex Agra Red Fort.